The farmers market has an abundance of farm fresh organic Asparagus. I always get my inspiration from seeing all the wonderful fresh produce. 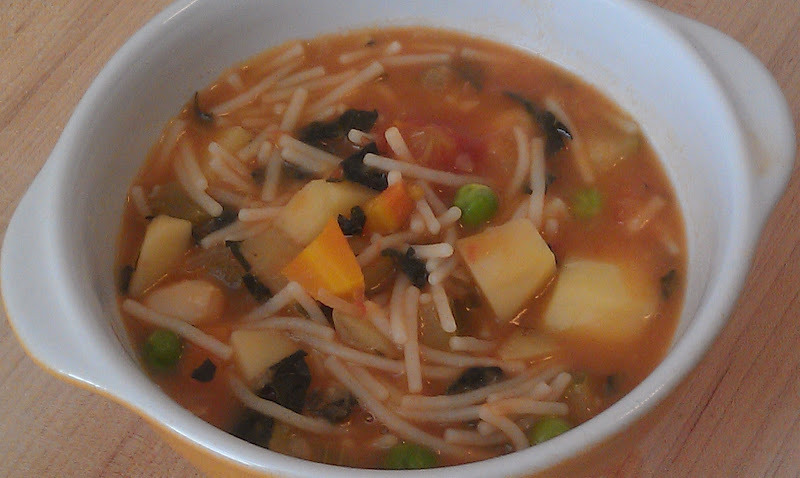 Try this delicious vegetable soup. It is quick and easy. Everything is going to be puréed, so you can give everything a rough chop. The stems from 2 bunches of asparagus, cut off an inch at the ends. Tips reserved. Heat the oil in a medium size pot. Add the onion and cook for 6 minutes, until it is has softened. Add the asparagus stems, the celery and the potato. Stir. Add the stock. Bring to a boil, reduce to a simmer and cook for 30 minutes. Remove from the stove. In small batches purée the soup with ½ cup of liquid at a time. Transfer to another pot or bowl. Add just enough of your leftover stock to form the consistency of the soup. It should not be too thin. Remember you can always add liquid but it is very hard to take out. Then transfer all to a pot. Add the asparagus tips and simmer for 5 minutes. Add the salt and a little pepper. Season to taste. 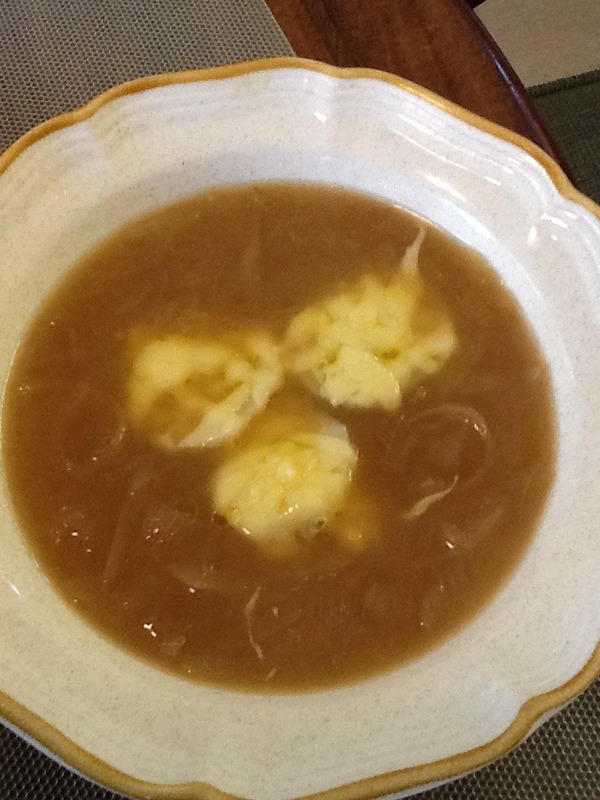 Some friends were coming to lunch and I decided to whip up a pot of French onion soup. It is really fun to serve. I substituted alkaline ingredients to make this very satisfying bowl of soup. In a large pot heat the oil and butter. Add the onions and the thyme. Cook 25-30 minutes until the onions have developed a nicely light brown color. Be careful not to burn them. Stir in the flour and mix thoroughly. Cook for about three minutes to cook out the flour taste. Add the broth. Season to taste. Continue to cook on a low simmer. For the garnish, peel and thinly slice the potato. Place in a pot of cold water and bring to a boil. Cook about 4 minutes until the potato is cooked. Drain, and set the potato slices on a baking pan. Sprinkle the cheese on top of the potato slices. Place under the broiler until the cheese has melted. Ladle the soup into the bowls. Place three of the potato/ cheese croutons on the top. 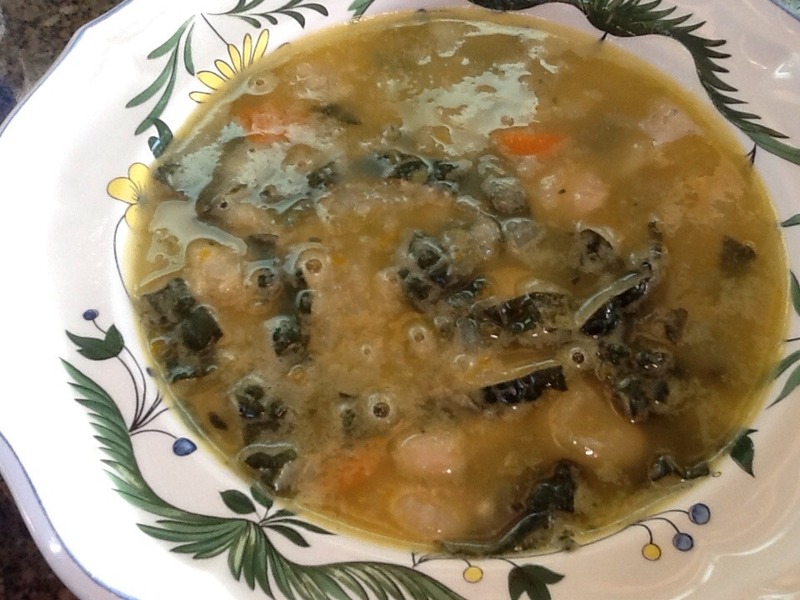 This is a hearty lentil soup filled with vegetables and beans. Heat the olive oil in your soup pot. Add the onions and cook about 6 minutes until they have softened. Add the celery, carrots and zucchini. Stir and cook about 3 minutes. Add the tomatoes, the lentils and the broth. Cook for 45 minutes and then add the beans and the parsley. Cook another 15 minutes. Then add the lemon juice, salt and pepper. I like to soak my white beans overnight in a bowl filled with water. Then I rinse them, put them in a pot, cover with water. Add an onion, a piece of celery and a carrot. Cook for about an hour until the beans are softened. Never salt the beans during the cooking. Wait until the beans are done. Adding salt will make the beans hard. You can also use canned beans. Just make sure you rinse them very well. 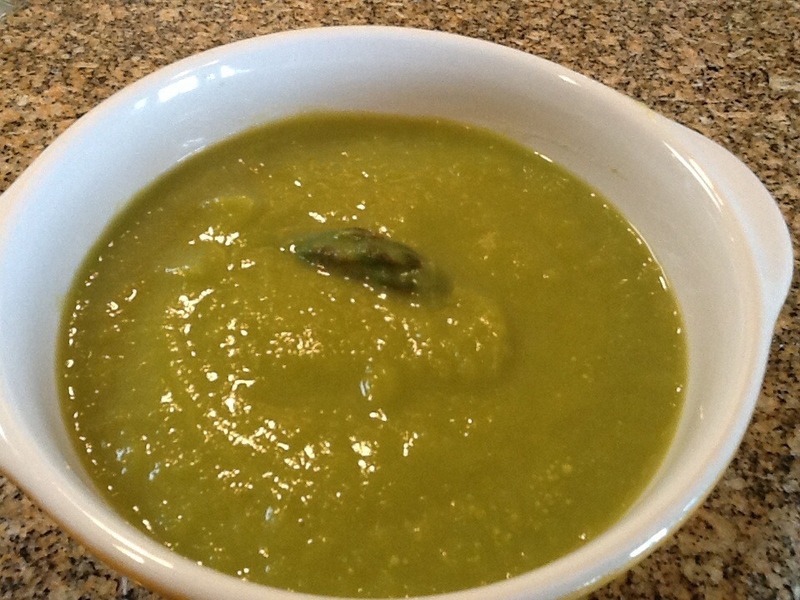 This is a very satisfying, quick and easy soup to make using some of our winter vegetables. Everything is going to go into the blender, so just a rough chop for all of the vegetables. Heat the oil in a medium pot. Over medium heat, add the onion and cook for 4 minutes. Add the leek and celery. Cook another 3 to 4 minutes. Add the cauliflower and potatoes. Season with the salt and pepper. Stir and mix everything together. Now pour water in, covering them with the water about 2 inches over the top of the vegetables. Cook for 30-40 minutes or until all the vegetables are tender. In small batches, put the soup in a blender and chop for just a second. Transfer the chopped soup into a large bowl. Continue until all the soup is chopped. I prefer a chunky style of this soup but if you prefer a creamier texture, you can totally purée this soup for a more elegant presentation. When all is blended, you might have some leftover water. It will keep in the freezer for the next time you make soup. Now transfer everything back to your pot, adjust seasoning and cook under a low fire until ready to serve. Pour into bowls, sprinkle with parsley and serve. White bean and lentil soup. This is a very easy soup to make. I used orange lentils and they all but disappeared in the soup but gave it a luscious thickness. I soaked and prepared my own beans, but you can use a can of beans if that is easier for you. I like to dice my vegetables all the same size. It gives a uniform look to the soup. Heat the oil in a large soup pot. Add the onion and cook about 5 minutes, add the celery, carrots, zucchini and the kale. Mix together and cook for 2 minutes. Add the lentils and stock. Cover the pot and simmer for 30 minutes. Add the beans and simmer for another 30 minutes. Now add your salt and pepper. Sometimes if you add the salt to the lentils beans during cooking, it can make them tough. Drain the beans and place in a pot of fresh water. Add 1 onion, cut in half, a stalk of celery and 1 carrot. Bring to a simmer, cover and cook about 1 hour. Taste a few to see of they are done. Drain the beans and transfer to a bowl. Note: they only last a few days in the fridge, but they freeze very well. I was at the farmers market yesterday and the butternut squash was on full display. It inspired me to make this soup. It’s quick and easy. It’s perfect to start a meal, or serve it with a salad and some crusty alkaline spelt bread and you have a delicious meal. Heat oven to 350 degrees. Cut the squash in half and scoop out the seeds. Place the squash flesh side down on a oiled baking sheet. Bake for 45 minutes. Set aside to cool. Melt the butter in a large soup pot. Add the onions, salt, cloves and cinnamon sticks. Cook over low heat for approx. 30 minutes, until the onions are a light golden color. Remove the cinnamon sticks, and discard them. Using a spoon, scoop out the cooked squash. Add to the onion mixture and stir. In small batches, blend the squash with the onion mixture and a little of the stock until all of the ingredients have been puréed. Transfer to the pot, adjust seasoning and add enough stock to form a good consistency. If you want a thicker soup, use less stock, if you prefer a thinner soup, use more stock. Heat soup thoroughly before serving. Spring is in the air and the asparagus in the farmers markets is just beautiful. I could not resist buying some. Use in a basic sauté, or compose a salad. This week, I decided to make a soup. This soup is good just about any time and it is also elegant enough to serve as a first course for a dinner party. It is very easy to make and within ½ hour you can make something that your family and friends will enjoy. Keep in mind that everything is going to be puréed so the size does not really matter. I always cut everything about the same size to ensure even cooking. This recipe is easy to double. Just use 6 cups of water. In a medium sized pot, heat the olive oil. Add the onions and cook about 6 minutes, until they have softened. Add the potatoes and the asparagus. Season with the salt and pepper. Pour In the stock. Bring to a boil, reduce heat and simmer for 20 minutes. Remove from heat. Put a strainer in a large bowl. Strain the soup, reserve the liquid. Place the vegetables in a blender or Cuisinart with 1 cup of the liquid. Purée. Add back to the pot and pour in another cup of the liquid. This might be enough. If you like your soups thinner, add more liquid. If you have leftover liquid, you can freeze it for making soup the next time. Heat the soup and add the asparagus tips. Cook about 5 minutes. Serve. This is a variation of my basic lentil soup. It turned out so good, I thought I would share it with you. It’s a creamier version. I used some orange lentils and they added a wonderful creamy texture to the soup. Here it is. Note: I like to chop up my vegetables all the same size. The soup will cook more evenly this way. And it looks very nice in the bowl. 11/2 tsp salt. Wait until the soup is done before you add the salt. It can harden the lentils while they are cooking. Optional: red pepper flakes. If you prefer a little heat. If you feel the soup is getting too thick, just add a little water. Remember, it much easier to add liquid, it’s hard to take it out. Heat the oil in a large soup pot. Add the onion and cook about 6 minutes to soften. Add the celery, carrot, turnip, parsnip, potato and zucchini. Stir in the lentils. Cover with the stock. Bring to a boil, reduce to a simmer and cook for 1 hour. This is a very hearty soup. It becomes a meal if served with a green salad, and a piece of spelt bread, spread with a little almond butter. I make lentil soup almost every week and this is a little different from my basic recipe. Experiment with different varieties of lentils. For this version I used the little French style green lentils. I like them because they maintain their shape and stay solid. Feel free to add other vegetables to this soup. 6 cups vegetable broth or water. Heat the olive oil in a large pot. Add the onions and cook about three minutes. Add the celery, carrots, squash, tomato, potato. Stir and cook another three minutes. Add the lentils. Pour in the broth. Add the salt and pepper. Bring to a boil, lower fire and simmer for one hour and fifteen minutes, it can cook longer if you prefer. I like topping the soup with a little bit of fresh parsley and a teaspoon of Parmesan cheese. I hope you enjoy this. It was raining and I decided to make a few pots of soup. It’s the best go to meal or snack for anyone on an alkaline diet. This soup is very filling and satisfying. Easy to make and freezes beautifully. I always have a quart of of soup in my freezer.I will post the other one in a few days. In a medium size pot, heat the olive oil. Add the onion, celery and carrots and cook for about 5 minutes, until the onions are soft. Add the zucchini, potato, kale and beans. Season with salt and pepper and oregano. (see note). Pour in the 5 cups of vegetable stock and the tomatoes. Cook for 45 minutes. Add the pasta and peas and continue to simmer until the pasta is cooked. About 10 minutes. Note: The amount of salt to use depends on the stock that you use. If your stock is salt free, you might need to add a little more. If your stock has salt in it, you might have to use a little less. It’s always good to taste while you cook to adjust the seasonings. Optional: Top with a spoonful of Parmesan cheese for a special treat. Tip: Since parsley is a very alkaline green. I often sprinkle it over my soups as an added punch of an alkaline ingredient. 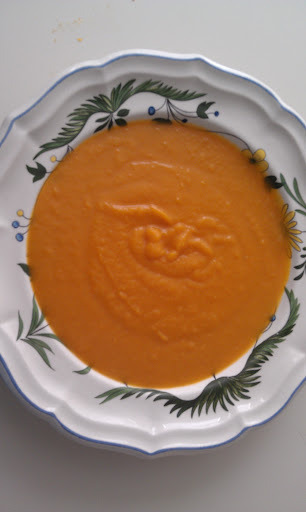 A reader asked for a recipe for Butternut Soup and I made this today and thought I would share it with you. My squash soup is different from most because I use mostly squash and very little liquid. I like the the soup to be thick and taste like squash. Feel free to play around with this soup. The exact measurements do not matter. I put them in as a guideline. Remember to taste as you go along so you can adjust your seasoning. 1-2 Butternut Squash (depending on what is available) you want to end up with about 4 cups of cooked squash. Don’t worry if it is a little more or less. It won’t matter. Cut the squash in half, scoop out the seeds and place on a foiled lined baking sheet. Add the olive oil and spread evenly on the foil. Place the squash flesh side down and bake in a 350 degree oven for 45 minutes. Remove from oven and let cool. While the squash is baking, melt the butter in a frying pan and add the onion and cinnamon sticks. cook on a very low fire until the onions reach a light golden color. 30-40 minutes. Note: You might not need all of the stock so start with ½ cup and add a little at a time. This is a fairly thick soup. Remember to taste and correct your seasoning. This lentil vegetable soup is wonderful to serve on a cold day. I have had it in my fridge all week and it has been my go to snack or meal. In a large soup pot, heat the oil and add the onions. Cook about 5 minutes until they have softened. Add the celery, carrots, turnip and kale. Mix together. Add the beans. Cover with the stock and simmer for 1 hour. To serve, Ladle into a cup or bowl and sprinkle the parsley on top. Note: I like to start with 5 cups of stock and get the soup cooking. I keep 1 cup on hand to add if the soup is coming out too thick. If you like a thicker soup, just use 5 cups of stock. For a thinner soup add more. Note: everything will go into a blender to be pureed at the end so a rough chop is all you need. In a large soup pot, heat the oil and add the leeks. Cook about 5 minutes do not brown. Add the potatoes, salt and pepper, then the water. Bring to a boil, reduce heat to a simmer. Cover and cook for 35 minutes. Add the watercress and remove from the heat. Let Soup rest for 10 minutes. In small batches, puree the soup. Save some of the stock, you will have about 1 cup left over. Pour the leftover stock into a freezer container and freeze for future use. This is a delicious soup that I know you will enjoy. I made it last night and it’s almost gone! It is very alkalizing. This is an easy soup to make. It should not take more than 30 minutes from start to finish. You can use any vegetables you have on hand. Feel free to substitute. Line a cookie sheet with tin foil. Slice the tortillas into thin strips. Toss with 1 Tbsp of the olive oil and spread them out in a single layer on the foil. Bake for 12-15 minutes until they have crisped up. Immediately take them out of the oven and place on a paper towel. Set aside. In a food processor or blender, place the onion, chili and garlic. Process together but do not puree to liquid. You want a little texture of the onion. Heat 2 Tbsp of olive oil in a pot. Saute the onion mixture until softened. About 6 minutes. Add the cumin, oregano, paprika and salt. mix together. Stir in the tomato and stock. Add the vegetables and cook for an additional 15 minutes or until vegetables are cooked. Ladle into bowls. Garnish with avocado slices, a little cheese and cilantro and the tortilla chips. In a large soup pot, heat the oil and add the onion. Cook on a low flame until soft, about 8 minutes. Add the carrots, celery, zucchini, potato and the cabbage. Season with the salt and stir. Then add the tomatoes and the stock. Cover and cook for 1 hour. This is a good soup hot or cold. Everything will go into a blender so do not worry about the shapes. Heat a pot with the olive oil, add the onions and cook on a low flame for about 10 minutes until onions are soft and sweet. Do not brown them. Add the broccoli, potato and stock. Season with Salt and Pepper. Bring to a boil, cover pot and turn down to simmer until the the potatoes are tender, about 10-12 minutes. Strain the soup and save the liquid. Put the broccoli and potato mixture into a blender. Pour half of the reserved liquid. Puree. Pour back into your pot. Add the additional liquid, stir. To serve, ladle into bowls and sprinkle a little basil on each one. It really freshens up the soup. 1 ½ lbs. Potatoes, peeled and cut into medium pieces. 1 lb. Leeks, use only the white part of the leak. Wash and give it a rough cut. 3 stalks of Celery, chopped. 1 Bunch of Fresh Watercress, including the stems. 2 tsp. of sea salt. In a large pot, combine the potatoes, leeks, celery, water, salt and pepper. Bring to a boil, cover the pot, lower the fire and simmer for 30 minutes. The potatoes should be fork tender. Add the watercress and turn off the fire. Let cool for 15 minutes. Puree the vegetables reserving 2 cups of the cooking liquid. (Note: You can freeze the extra liquid (stock) and use as a soup base for another time).